New Martinsville City Hall is located at 191 Main Street, New Martinsville, WV 26155; phone: 304-455-9125. Photo: Street View from North and Maple Streets, North Street Historic District, New Martinsville, WV. The Historic District was listed on the National Register of Historic Places in 1980. Photographed by User:Bwsmith84 (own work), 2011 [cc0-by-1.0 (creativecommons.org/publicdomain/zero/1.0/deed.en], via Wikimedia Commons, accessed June, 2015. 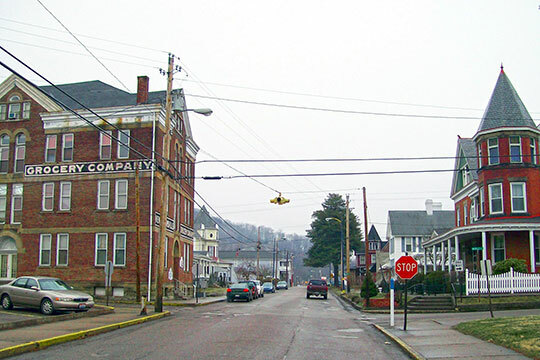 New Martinsville, the county seat and principal municipality of Wetzel County, West Virginia, came into being around 1780, when the area was a wilderness and part of Ohio County on the Virginia frontier. The first settler was Edward Doolin who settled at what is now New Martinsville during the American Revolution. Here he patented 800 acres of land. Doolin's tenure of the land was short as he was killed by Indians on September 20, 1782. This was approximately the same time as famed General George Rogers Clark fought a small skirmish with Indians near New Martinsville. Doolin's family retained ownership of the land, however, and kept it until 1810 when it was sold to Presley Martin. Martin later laid out the town and served, decades later, as the first clerk of the Wetzel County court, Presley Martin built a house at the mouth of Big Fishing Creek in 1813 and this homestead served as the first real settlement at New Martinsville. About 1848 the name of the community was changed from Martinsville to New Martinsville to avoid confusion with the post office in Martinsville, Virginia. The first Wetzel County Courthouse, on the same site as the present one, was completed in 1852. Both Methodist and Presbyterian churches constructed edifices in the 1850s, and the same decade saw the founding of the first school, the New Martinsville Academy. Michael J. Pauley, Historian and Michael Gioulis, Preservation Planner, Pauley & Gioulis, New Martinsville Historic District, Wetzel County, WV, nomination document, 1987, National Park Service, National Register of Historic Places, Washington, D.C.